Since we started growing grapes at Awan Damai, we started looking for recipes with these ingrediends. 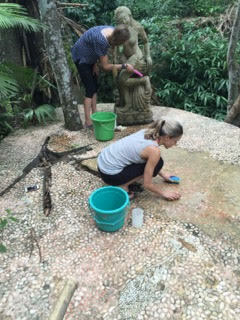 Sabine from Austria and Shannon from California are lovingly cleaning our Water Angel and the place on a little island at the end of Jiwa Damai walk ways. They have to use a brush to remove all the algae which settles on the stones and the statue. At Jiwa Damai we are happy to host many yoga groups who are training in order to become yoga instructors. Here are the lovely thoughts of Mindi. And this is a surprise song from our February’2015 group. 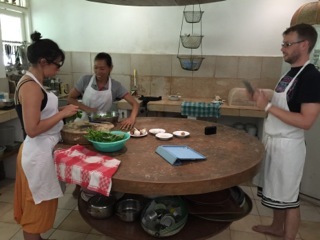 Our honeymoon couple is taking a cooking class with our Balinese chef, Made. This is one of the programs Jiwa Damai is offering for its guests.